How can virtual servers and bundled workloads be guaranteed to not be hosted by the same hypervisor? Certain virtual servers or bundled workloads need to be hosted on different hosts. 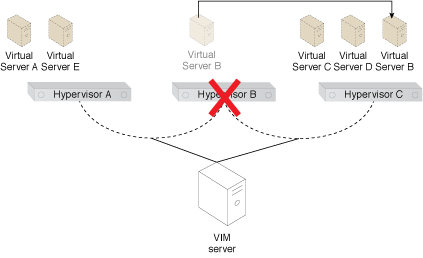 Anti-affinity rules are used to ensure that the virtual servers or bundled workload are never simultaneously hosted together by the same destination host. Affinity rules are applied and configured by the application of the Virtual Server-to-Virtual Server Anti-Affinity pattern, and are controlled and dedicated by the VIM server. The steps comprising the application of the pattern are illustrated (Part I). 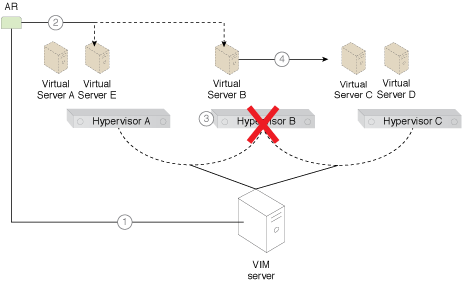 Virtual Server B is moved to Hypervisor C, after the system learns of the anti-affinity rule defined for Virtual Servers A and B (Part II).